The Z-Lite is made of closed-cell foam that will not absorb moisture. It is orange in color on the top (sleeping side) and dark grey on the bottom, as seen to the right. I can see no difference in the surfaces other than the color. The over-all thickness is 0.75 in (20 mm), but the thickness of the foam is only 0.3 in (8 mm) thick. 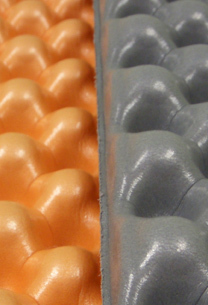 The over-all thickness is achieved because of the egg-carton shaped pattern it has been constructed with. 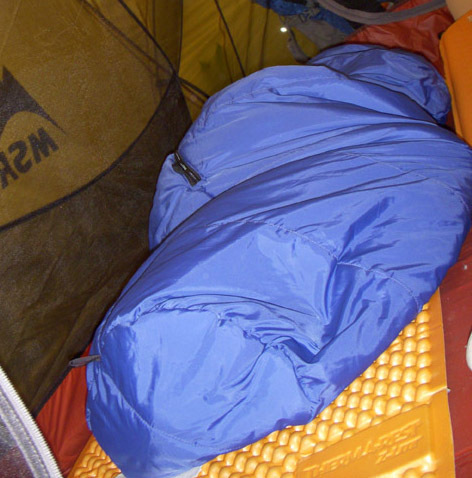 This technique allows a lot of dead-air space to be trapped between the user and the tent floor (or what ever it is on). This is claimed to increase warmth and softness. Another thing it does is allows the pad to fold up accordion-style with the grey bumps of the bottom sliding into the orange depressions of the front. This lets it pack down to about two-fifths of the size its thickness would suggest. It turns into the roughly square shaped bundles seen above. Once unfolded it lays fairly flat. It does keep some shape retention causing it to rise up from the surface a bit as may be noticed below. 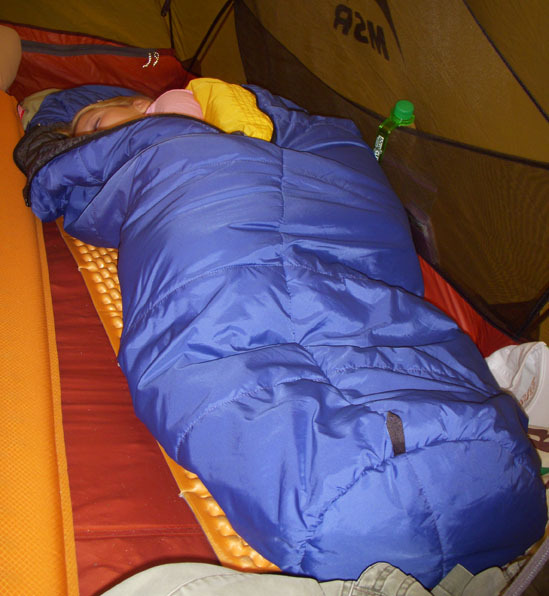 My twins Emma and Raymond used the Z-Lite pads in a MSR Mutha Hubba tent on the following trips, all in summer of 2008. We started by carrying them around Buffalo River State Park, Minnesota for a practice hike as seen above. 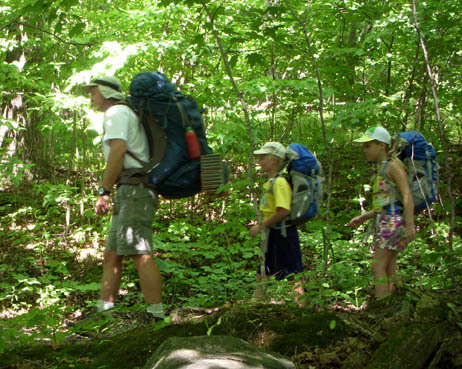 (In the summer we can only hike on the trails, all camping must be done in the "campground".) After a couple miles of "packing" along three of the hiking trails we went back to our camp spot. We went to Itasca State Park , the birthplace of the Mississippi River where we got a permit for one of three sites at Myrtle Lake. 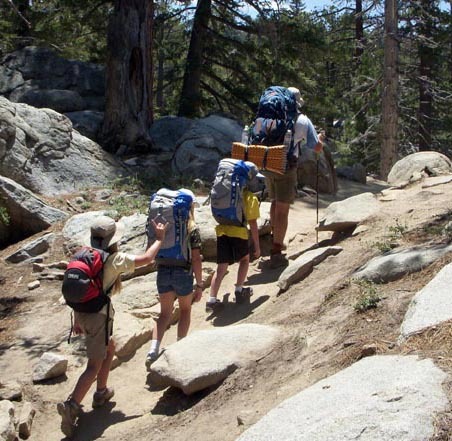 (Backpacking sites are issued just like camp sites in a campground, a new one for me.) This four mile (6 km) round trip hike was on easy terrain as it is almost all grass, at the worst dirt. Temps were from 64 to 80 F (18 to 27 C) at an elevation of 1500 ft (460 m). I bought the Z-Lite pads in May of 2008 expressly for my twins Emma and Raymond to use for a whole summer of backpacking we had planned. As I knew that I would be carrying a lot of weight hauling gear for the three of us I was very interested in finding something that would work for them with as low a weight as possible. 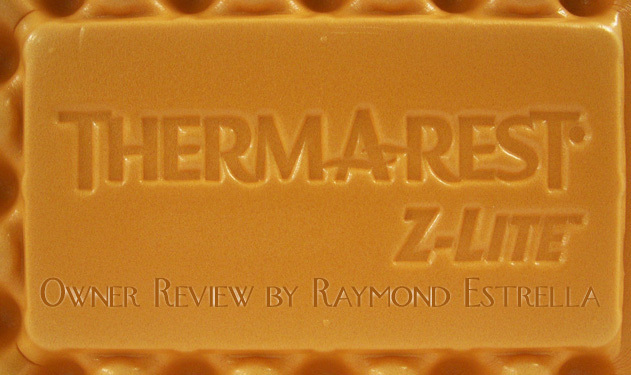 I have a regular length Z-Lite pad (15 oz/440 g) that I use in winter occasionally to boost the R-value with other pads (I will mention my opinion of the Z-Lite at the end of this review). I had the kids try it out and they said they liked it, so I got them the two smalls. They insisted on sleeping on them in the front room when they first got them. Their low body weight seemed to keep the egg-carton ridges from collapsing too much giving them a soft and comfortable sleeping surface. As can be seen in these pictures Emma and Ray (who is buried in his bag) look like they are having sweet cushioned dreams. And I did not mind carrying the combined weight of both of them. I stacked them both together and then attached them to my Osprey Argon 110 with the pack's lower sleeping pad straps. The Z-Lites actually helped my pack sit stably when I would take it off. Here is a picture on our way to Round Valley in Mount San Jacinto State Park. They are a lot more durable than I thought they would be. They have a few scratches and permanent indentations, from sitting against rough granite most likely. But neither of them have any tears or holes. As can be seen above I snug them down pretty tight to make sure they don't slide around but they do not retain the strap indentations after a day of hiking. On the trip above because of logistic problems they were strapped down for over 12 hours like that but showed no sign of it an hour after unloading. Here is a picture as we trek through the hardwood forests of Minnesota. While the Z-Lites have been great for the kids I thought that I should share my experiences with the regular size Z-Lite I have. I am not an Ultra-light backpacker by any means. My brother-in-law Dave is for 3-season hiking, often carrying loads that I can only touch if I leave one leg at home. (Uh, uh, don't go there�) I do try to lean towards the lighter end of the scale for most of my gear purchases though. I bought my Z-Lite to use in winter to put an extra insulating layer between me and the snow before I got some pretty high-tech winter pads. And it works exceptionally for this use. It seems to grip very well too, although I may not notice much slipping as I can make a darn level pad with my shovel and snowshoes in winter. But at least one time each year I do what I call a "Dave hike". On this hike we go for three days and I try to take the lowest weight I possibly can. But I still have to take my own tent and such, and I do not have any little Bear Burritos to sleep in like Dave does. So one year I took the Z-Lite as my only pad to cut weight. At the time I was up to my high body weight of 220 lb (100 kg). (This was before the crazy monster-distance hikes I have been doing the past 3 years.) And I have to say that the Z-Lite did not work well for me at all. But as a side-sleeper I put a lot of pressure against my hip and shoulder as I sleep. 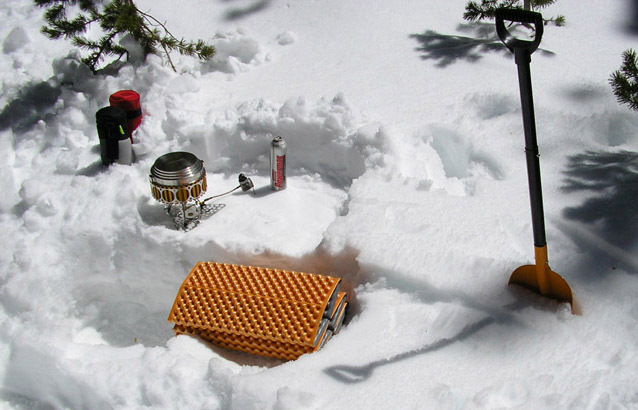 And all of my big trips are in the Sierra at high altitude, with most camps above tree-line meaning I am setting up on rock most of the time. Dave, who is a back sleeper, has one (actually he has two, he brings both in winter some times) and does well with it set up a short distance away.